013. CAPT L. E. G. OATES. Issued by Brooke Bond Oxo Ltd. (Tea) (1982). It is card #34 from a set of 50 cards entitled "Queen Elizabeth I - Queen Elizabeth II". Size: 2.7" x 1.4". 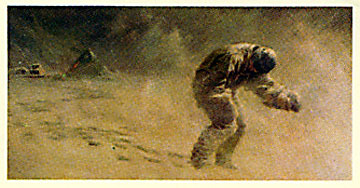 Recto: Dollmann's painting of Oates walking away from the tent.